Dowagers hump mattress buying help. Your mattress can make a difference in your sleep and your daily life if you have a back hump. If you have Kyphosis or dowagers hump, you need to pay special attention to what you sleep on. At the end of the day your muscles may be tired. So there is a tendency to want to sink into something soft and cloud like when you go to bed. This may be what we desire but it may not be the best thing for us or our backs. A soft mattress has been shown not to be a good choice for those with spinal Osteopenia or Osteoporosis. Rather a special report in US News & World Report states that: "A very firm mattress is the best type for people with spinal osteoporosis. For comfort, you can cover it with synthetic sheepskin or an egg crate mattress pad." How firmness in a dowagers hump mattress can help you feel better. Many persons with back hump think that a soft mattress is 'just what they need'. 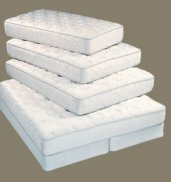 But if you use a soft mattress, your spine will not get the kind of support that it needs when you are in bed. This is important. You do not want another vertebral fracture! Shop around. Get a firm dowagers hump mattress. If you can not afford to buy a new, firm mattress, you can try improving the firmness of your current one by putting a piece of plywood between it and the box spring.This may not be as comfortable as some of the newer brands but it will give your spine the kind of support it needs. The other alternative is to buy a new mattress - one that is really suitable to your needs. There is a wide range of prices and models. You can find them priced from a few hundred dollars through the thousands. But price alone is no guarantee you will have a good dowagers hump mattress. So when you are shopping take your time. Be sure to wear shoes you can slip off easily so you can try each mattress out. Remember you are buying something that will affect not only your sleep but also how you feel during your waking hours. The right mattress can contribute to a really good night’s sleep. And it will give your spine solid support. You'll wake up feeling rested and refreshed. The wrong mattress one can contribute to overall aches and pains as well as aggravate your back pain. Go and try some out. Some companies that sell via mail order will let your try their product for some weeks or months before making your purchase final. Do not be afraid to take them up on this. Sometimes a new one takes 'getting used to' and for the first few nights it feels strange. But then after awhile, you find your self sleeping well and waking refreshed. AND your spine has had good support all night long! Remember that there is a great range of personal preferences. What works for one person may not work well for another. That is why it is good to try several makes and models before making your final choice. Shop around. Take your time. Remember that a good mattress, like a good pair of shoes, is really an investment in your daily well being. Solutions and treatments for kyphosis. Read about postural taping to relieve some of the difficulties.